Just Cruises Inc. is one of the top agencies in the country. Based on our volume we are given preferred pricing and additional amenities on many cruises. If you have been offered a low price and are ready to finalize your travel plans, please complete this form for an opportunity to save even more money with Just Cruises, Inc. 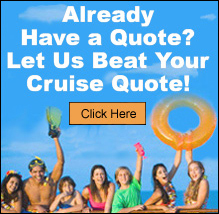 Already Have a Cruise Quote? See If We Can Beat it! Please allow 1 business day to receive a reply, Monday through Friday. If you require an immediate response, please call in your Beat-A-Quote request. Thanks. Your Last Name: RequiredInvalid format.